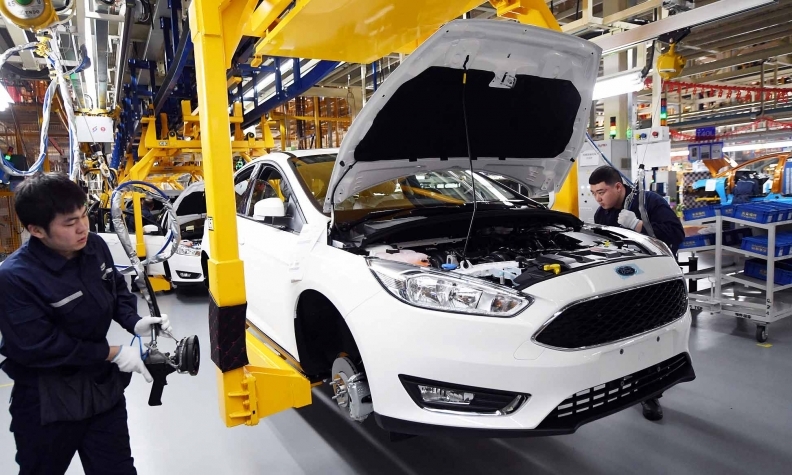 Workers assemble vehicles at Changan Ford plant in Harbin in March. BEIJING/SHANGHAI -- China will end foreign ownership caps on local auto companies by 2022 and will remove restrictions on new-energy vehicle ventures this year, a major shift that will open the market wider to global automakers. The country will remove limits on companies making full electric and plug-in hybrid vehicles in 2018, commercial-vehicle companies in 2020 and the wider passenger vehicle market by 2022, China's state planner said in a statement. The move, which comes amid a trade standoff between Washington and Beijing, signals the end of a rule put in place in 1994 in the world's largest auto market limiting foreign carmakers to owning 50 percent of any local venture. The policy was implemented to help domestic carmakers compete against more advanced international rivals. Analysts said the main beneficiaries, at least in the short term, would be carmakers focused on new-energy vehicles, including Tesla, which has been seeking to set up a wholly owned plant in Shanghai. Tesla chief Elon Musk said last month China's tough auto rules for foreign companies created an uneven playing field as scores of local and international companies compete for a slice of China's fast-growing market for green cars. Traditional automakers will need to wait longer for any direct impact and may even see more risks than opportunities in ditching their joint venture structures, said James Chao, Asia-Pacific chief at consultancy IHS Markit. "Foreign companies may already be in a box" in China, said Chao, adding the joint venture structure was now so ingrained many might not want to change it. A senior General Motors executive said last week that even without ownership caps the U.S. carmaker would not cut ties with local partner SAIC Motor Corp., adding GM would not be as successful in China on its own. The person asked not to be named because of the sensitivity of the matter. GM said last week the company's "growth in China is a result of working with our trusted joint venture partners." Japan's Nissan said in a statement it would "monitor how any specific policies develop and will plan accordingly." Honda said its China business had grown on the back of strong local tie-ups. "At the moment we have no plans to change our capital relationship," a Honda spokesman said. China will also scrap foreign ownership limits in the ship and aircraft manufacturing industries in 2018, the National Development and Reform Commission said. The highly symbolic moves in autos come after President Xi Jinping said last week the country would scrap ownership limits "as soon as possible," exciting global auto brands even as China and the U.S. spar over trade tariffs. China -- which said the easing of auto rules is unrelated to its trade dispute with the United States -- is keen to portray itself as open for business. Its ties with the world's largest economy, though, are becoming increasingly fraught. The United States on Monday banned American companies from selling parts to Chinese telecom equipment maker ZTE Corp. for seven years, creating a new fissure in Chinese-U.S. ties. China on Tuesday said it will slap a temporary fee on U.S. sorghum, used as feed meal in China, in a preliminary anti-dumping ruling after a Chinese probe launched more than two months ago.